Oils can be separated into Saturate, Aromatic, Resin and Asphaltene fractions, together also called SARA. Radke et al. (Analytical Chemistry, 1980) described a method to carry out a preparative separation by Medium Pressure Liquid Chromatography (MLPC). Isolab owns a system based on this article which was built by Helmud Willsch, co-autor of the aforementioned article. Besides the preparative MPLC method, a qualitative TLC-FID method is available to analyse the relative amount of each fraction in an oil. Depending on the customer’s needs, the light compounds can be removed from the oil sample by “Topping”: The oil is placed in a vacuum chamber (50-100mbar) at 60 degrees Celsius for 72 hours under a gentle nitrogen flow. Samples are weighted before and after topping to calculate the weight loss. Usually oils are topped before MPLC separation when the obtained fractions has to be used for stable isotope analysis. Because the lack of volatile compounds in such fractions, isotopic analyses are more reproducible. 10-250 mg of (topped) oil sample is weighted, dissolved in n-hexane and deasphaltated by filtration. The sample is injected into the system where a flow of n-hexane takes it to a pre-column filled with silica where the Resins, also known as NSO-compounds are retained. Subsequently the remaining sample flows through the main column where the aromatics are retained, while the saturates elutes and are collected by a fraction collector. Then the flow of the main column is reversed (backflush) and the aromatics elutes and are collected by the fraction collector. The separation process is monitored by a RI-detector for the saturated compounds and a UV-detector for the aromatic compounds. The resins are flushed from the precolumn with a mixture of DCM/Acetone, and all fractions are evaporated in a Turbovap at 30 degrees Celcius under a gentle air flow. After the fractions are weighted to calculate the yield, they can be used for further analyses. TLC-FID is a qualitative analysis usually carried out on topped oils. A small amount of topped oil is dissolved in DCM and spotted onto a silica coated TLC-rod. The solvent is evaporated and the tip of the rods are subsequently placed in different solvents letting the fractions elute. 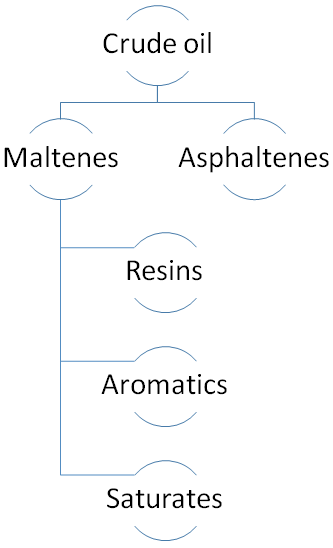 For the usual SARA analysis the used solvents are n-Hexane, Toluene and a mixture of Methanol and DCM but depending on the wishes of the customer another set of solvents can be used. After elution, the rods are dried and placed in the Iatroscan where FID flame analyses the separated fractions.